This blog has tended to report matters of synodical detail and politics – close votes, tea-room gossip, and so on. 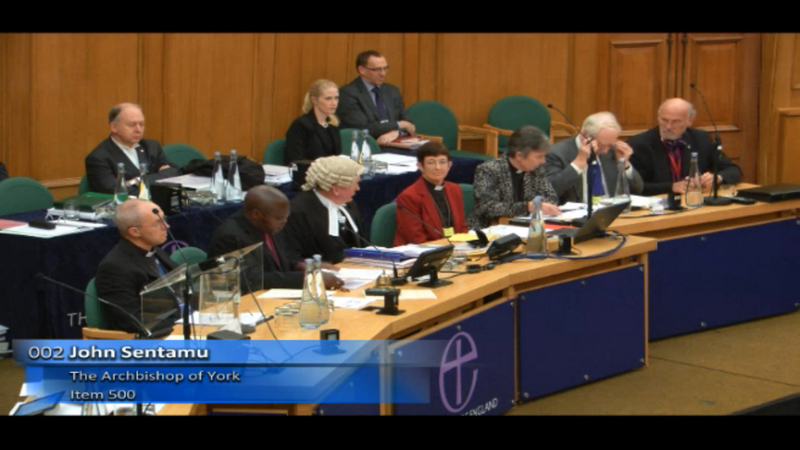 But today it all happened on the floor of Synod, and it was all over in five minutes. The Registrar, Stephen Slack, read out the royal proclamation, and we voted on a show of hands to go with it. That’s me, the balding head on the bottom right with the luminous screen and my hand in the air. Bizarrely, as I looked round while voting, I saw most of the small group behind me – about a dozen of them) were not raising their arms. Then, when the ‘No’ votes were called, I saw they were all voting against. It felt very odd – as ifs I was sitting into he wrong place. Anyway, the vote was overwhelming, with maybe two dozen against. The ‘Gang of Six’ then had to sign the document – that is, the two Archbishops, clergy Prolocutors and Chair and Vice Chair of the House of Laity. It was slightly comic to see them shuffling the paper along the bench and then passing the pen to each other. Once it was done, we had a moment of silence. Archbishop Sentamu had warned against any cheering or applause – we were to be in ‘dignified silence’. Then he led in prayer (the General Thanksgiving and a collect). And then it was on to next business. It was an epic, passionate address and you can read it here. Or watch it via YouTube here. There was a very sombre mood for the rest of the day. The opening Report of the Agenda brought forth some heavyweight stuff about the forthcoming human sexuality discussions. I attempted a rather more lightweight contribution about preparations for the election of a new Synod next year and the need to help educate Synod members in our strange ways – and the use of social media to inform, educate and entertain the folks back home on all things synodical. Something I hope this blog does for some of you. We got through a mountain of legislative stuff – everything from the rules allowing sheep to safely graze in rural churchyard without needing a faculty (no, really) to reforming the voting rules affecting the Diocese of Europe. The major item of interest for me was the Guidelines for Professional Conduct of the Clergy (read them here). As predicted, there was much concern about the risks of the confidentiality applicable to formal confession. As I noted in my earlier post (but I was not called the speak) this is a tangle that needs sorting out. The Bishop of Durham helpfully clarified the church’s position on reporting abuse; one or two clergy wanted to maintain the ‘traditional’ seal of the confessional. The lawyers and the working party will have to untangle it all now. Question Time brought forth a little trickle of uncertainty and (I suspect) resentment about the Green Report. No, nothing to do with carbon footprints, but a document not seen by Synod, but alluded to by some questioners who have got to hear about it somehow. It is (apparently) looking at ways in which the Church can develop and ‘bring on’ future leaders. Andreas Whittam Smith spoke of the £2m the Commissioners are putting into the project (I think I heard that right). A succession of largely hostile questions did little to illuminate things, other than a extracting a commitment from the Bishop of Ely that Synod might get to see the report in February. So, not the most gripping day, but a highly significant and memorable one. It was good to be there. 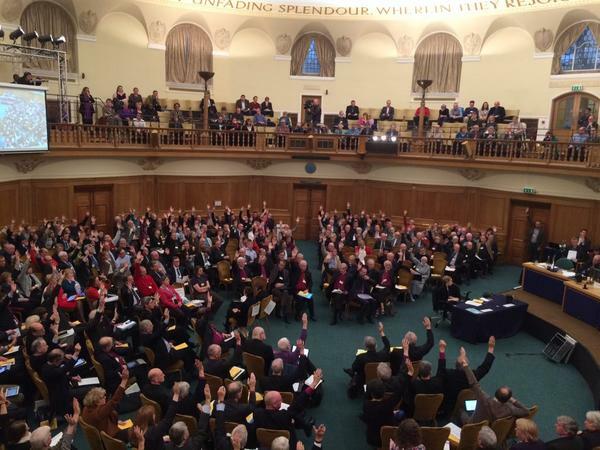 This entry was posted in 2014: Nov - London, General Synod and tagged Archbishop Sentamu, Archbishop Welby, Church of England, Synod vote on women Bishops, women Bishops. Bookmark the permalink.